Sagkeeng Mino Pimatiziwin Family Treatment Centre Inc.
Sagkeeng Mino Pimatiziwin Family Treatment Centre strives for excellence in support of hope and recovery. 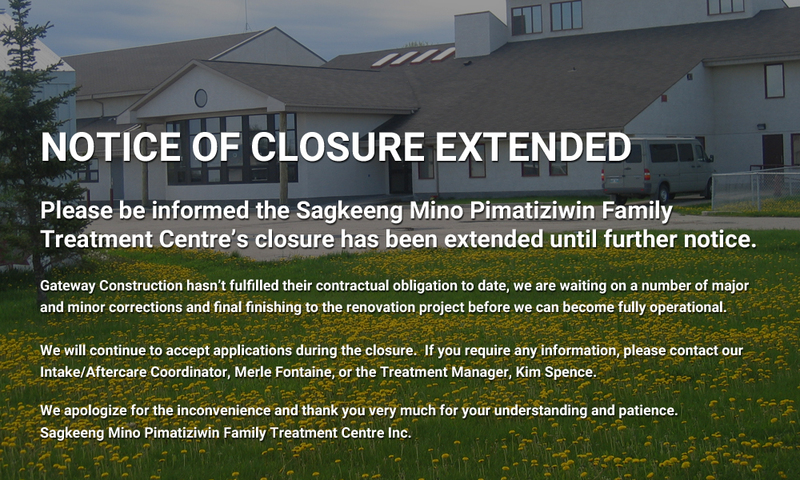 The Sagkeeng Mino Pimatiziwin Family Treatment Centre is a family addictions treatment facility located in Sagkeeng, Manitoba. We offer a seven-week traditional and holistic treatment program in a residential setting for First Nation & Inuit families struggling to overcome drug and alcohol addictions. As with other Native addictions treatment facilities, the core of our program is based on the culture and traditions of Indigenous People. We have self-contained suites for up to four families, a day care, classroom, family room, and sweat lodge. A certified teacher staffs our centre for school aged children and adolescents. Prior to arriving, parents are required to make arrangements with their children’s home school to bring enough work for the duration of treatment. A certified teacher will provide educational support during this time. 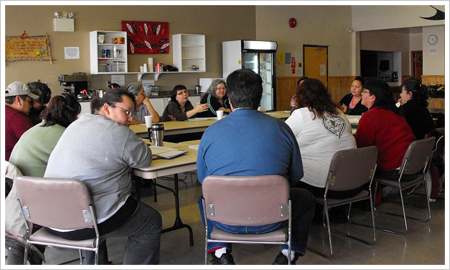 The centre became operational in 2004 to provide addictions treatment to First Nation and Inuit families. We offer a culturally oriented program that is designed to instill pride and empowerment to our families. The traditional teachings permeate throughout our weekly programming. Connect with a referring source such as a NNADAP, Counselor, CFS, or other appropriate resource. If referral package is incomplete a letter identifying such will be forwarded to the referring source. Upon availability, a telephone call along with a letter is sent to the referring source. Referring source makes the proper arrangements for the family to attend treatment. Copyright © 2019 Sagkeeng Mino Pimatiziwin Family Treatment Centre Inc.